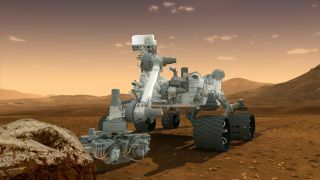 An artist's conception of NASA's Mars rover Curiosity. Space tech NASA's Mars rover Curiosity uses to search for methane on the Red Planet is being adapted to detect gas leaks here on Earth. Engineers with NASA's Jet Propulsion Lab in Pasadena, California originally developed the laser technology to hunt for traces of Red Planet methane, which could be a sign of possible Mars life. But methane is also one of the main components of natural gas on Earth, so the California-based Pacific Gas and Electric Company (PG&E) is incorporating Curiosity's tech into a hand-held device that could be used to quickly track down and repair potentially dangerous gas leaks. PG&E supplies electricity to nearly 40 percent of California. Many people consider natural gas a "bridge fuel" that could help wean humans off coal and push society toward greener, renewable energy sources. But natural gas comes with its own set of problems, including the environmental impact of fracking and concerns about pipeline safety. Applying the space technology to Earth-based operations could improve pipeline safety, researchers said. PG&E was recently fined $1.4 billion for a 2010 natural gas pipeline explosion in San Bruno, California. The blast flattened a neighborhood, killed eight people and injured 66, according to naturalgaswatch.org. If the proposed fine is finalized, it will be the largest safety-related fine issued by CPUC. Before the laser technology makes its Earth debut, the 1-ton Curiosity rover will continue using it to comb the Red Planet for signs of methane. The tech is integrated into Curiosity's Tunable Laser Spectrometer, part of the six-wheeled robot's Sample Analysis at Mars instrument suite. A variety of instruments in space and on the ground have detected methane in Mars' atmosphere over the years, but only in very low concentrations. The atmosphere around Mars is oxidizing, which means methane produced there should be converted into carbon dioxide relatively quickly. Some scientists therefore think any methane that exists in the Martian atmosphere must have been produced in the recent past — perhaps by comet strikes, water-rock interactions or, most intriguingly and controversially, by Martian lifeforms. Curiosity is searching for any methane leaks on the surface of the planet that could be contributing to the traces spotted in the atmosphere, but the rover has not found any signs yet.